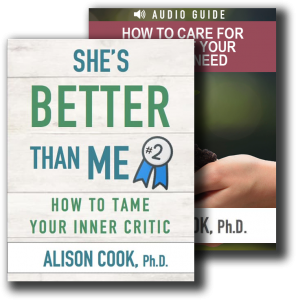 Taking a You-Turn with Your Emotions - Alison Cook, Ph.D.
A decade ago, when I was single and working my way through graduate school, I found myself envying a woman I worked for. I didn’t want to envy this lovely woman who’d been nothing but kind to me. I hated feeling that way. But beating myself up about this feeling got me nowhere. I decided to get curious about my envy instead of trying to stifle it. What is it about her life that stirs up this unpleasant feeling inside of me? I shifted from envying her to recognizing she had much to teach me — and I began to take notice. There were many things about her I admired: how she engaged her own work with passion but always took time to be present with her family … the light-heartedness evident in her relationships with others … the way her home was welcoming andlived-in. There was always an extra seat at her dinner table, an open invitation for connection. As I took notice of her life I realized that my own life had become a little out-of-balance. My work had taken over at the expense of connecting with others. Envy became a cue that something in my own life needed to change. When you’re feeling envy, anger or resentment, it’s good to ask what else is going on inside. Is there another part of me that’s hurting and I’ve been exiling? If so, it needs to be drawn in closer so to give it the care it needs. Or, is there a part of you that’s become reckless and needs some gentle boundaries? Notice the cues. Listen to your pain. When challenging emotions make their presence known, take the opportunity to evaluate what is going on inside of you. Which parts of your soul need your time, attention and redirection? Painful or troubling emotions present opportunities for growth and healing: Internal conflict is often growth trying to happen. God’s Word reminds us that gaining wisdom and insight is worth it in the long run. As we see in today’s key verse, “The one who gets wisdom loves life; the one who cherishes understanding will soon prosper” (Proverbs 19:8). 1.) Focus on the challenging or overwhelming emotion. 2.) Extend compassion toward this feeling you don’t like. 3.) Invite Jesus to draw near. Just the other night, I stopped to take a break from my work to snuggle up with the dog on the couch and watch a silly TV show with my daughter. As we laughed out loud in our very lived-infamily room, I remembered, with gratitude, that woman whose life I had once envied. With the help of God’s Spirit, I’d been able to focus on a feeling I didn’t like and allow Jesus to transform it. As a result, I gained access to some of my deepest desires and was able to take steps to change my own life. When you spend time with God, don’t leave your unwanted thoughts and feelings at the door. Instead, get curious about them and invite Jesus to be near them, too. Hi Alison, I just want to say “thanks.” I’m so appreciating your new book, finding it deeply helpful both for myself and in my practice as a spiritual director. I’ve already recommended it to various people, including my own spiritual director and counsellor, who have both bought copies. I also shared about it on my blog this morning. Thanks so much for your faithfulness in doing the hard work of co-writing your book and putting it out there! May you be blessed as your work is blessing so many others. Thanks you so much for taking the time to write this note, Carolyn! Your words are a gift, and I am so grateful that you have found this labor of love to be helpful.